The twin cockpit clinker runabout was built by Bruce Walker of Heyfield, Victoria, in 1965. A Mr. Bruce Castles, who was a part owner with his brother Brian of Mitre 10 in Sale, Victoria, remembers supplying Bruce Walker with scarfed Coachwood Marine Ply and Silky Oak for ribbing that same year. It would be fair to assume that this was the timber used in this boat. Bruce Castles was apparently a ski boat nut from Glenmaggie. Peter Andrewartha owned the boat until 1973 when it was purchased by Dirk Buys of Denison. He used the boat for family skiing on Lake Glenmaggie and at this time it was named JOEY. This may have been the original name. 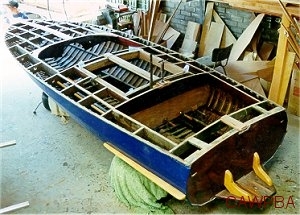 The hull had suffered stem damage and had been re-planked due to a coming together with a Bulls Cruiser on the Lakes in the 1980’s. The boat was sold by Dirk Buys in 1982 to a store owner in Heyfield. 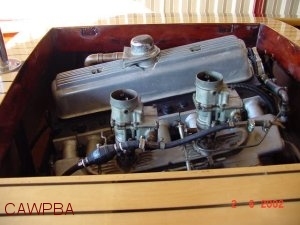 There are many stories of broken down Dodge side valve six engines and that the store owner from Heyfield committed suicide beside the boat in his garage. Maybe constant repairs to the old Dodge got to him. There is no further record on the boat until it was purchased by Bill Bradford of Croydon in Melbourne in 1990 as a project boat. By then it had a chrome “Minx” badge from a Hillman car on the dash and was known by that name. Bill Bradford also owned a Lewis very similar to the Walker and decided skiing was a preferable option to restoring and he sold it in 1994. 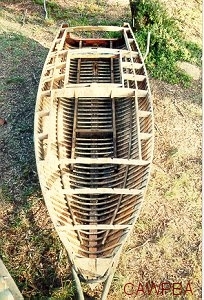 James Frecheville & Co., Boat Builders of Paynesville, Victoria, restored the boat in 1995. There was also some use of Huon Pine in the restoration. 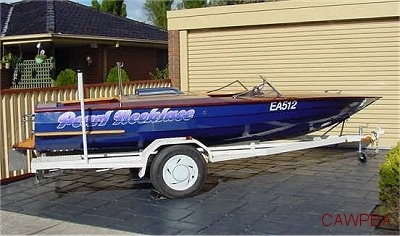 Neil Taylor of Middle Park, Melbourne, became the owner around 1998 and he fitted a Grey Holden motor and used the boat only a couple of times before putting it in storage as he found it was unsuitable for his very young family. It has been shown several times at the Melbourne and Hobart Boat Shows. 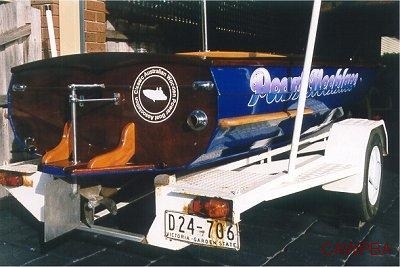 Keith Laws purchased the boat 2002 and as it had no sign writing, it was renamed “Pearl Necklace”. 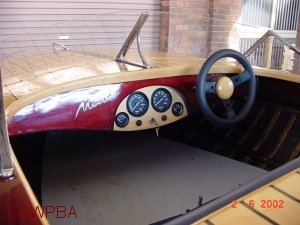 It still retained the original Minx badge on the dashboard. 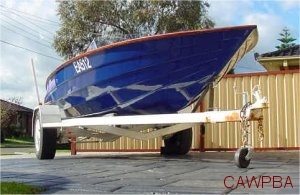 The boat was sold in 2004, moving to NSW and then sold again in 2012 and brought back to Victoria. It has been renamed Minx.